As municipalities trim their holiday budgets this year, they can trim their outdoor public holiday Christmas trees with energy efficient LED tree lights. Many towns have cut their holiday budgets in an effort to save tax payer dollars in an economy where many are financially stressed. LED tree lights are a smart answer to how to save money while sharing a bit of cheer within a community. LED tree lights are reported to use 90% less energy than traditional tree lights. LED tree lights have a much longer bulb life and are reported to last between 50,000 and 100,000 hours. LED tree lights can be used for many more years saving tax payers money over the long run. 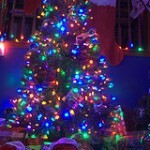 Tax payers will also be impressed to know that LED tree lights are Energy Star approved products. LED tree lights may save money but they do not scrimp on beauty. LED tree lights are just as bright and beautiful as their traditional counterpart. LED tree lights glow with brilliance and bold illumination making them a radiant decoration for any Christmas tree. The City of Chicago puts up a beautifully decorated Christmas tree in Daily Plaza every year. In the past, the tree was built out of many smaller trees aligned together to make one large shaped and very tall Christmas tree. This year, in an effort to save money, a single tree about a third smaller and donated from a nearby suburban family was chosen for display in the Plaza. Unfortunately, the tree has been compared to the meager tree Charlie Brown chose in the movie, A Charlie Brown Christmas. Like in the movie, this is a good time for people to reflect upon the true meaning of Christmas. The Daily Plaza Christmas tree will look just as beautiful this year when fully decorated with its LED tree lights and other decorations. The radiant energy given off by the LED tree lights will give many much cheer and joy this holiday season. The Daily Plaza Christmas tree may not be as tall and full as in previous years but it will ignite the holiday spirit within many who have the privilege to see it. Some cities have decided to do away with their large decorated public Christmas tree this year in an effort to save tax payer dollars. Fortunately, festive lights can be displayed in other ways keeping the holiday magic alive while answering the need for reduced budgets. Cities can create holiday magic by placing festive lights on parkway trees, lamp poles, novelty decorations, or outlining public buildings. Different shaped festive lights, like snowflakes or starlight spheres, can add a lot of interest with minimal usage. Festive lights have been a popular Christmas tradition creating a special time of year with fun and hoopla. Festive lights can help make the holidays more joyful and celebratory encouraging community and kinship. 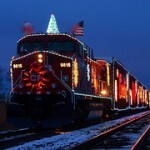 Many children and children-at-heart have a fascination with trains and with a holiday lights train. Popular Christmas gifts throughout the past few decades have been train related thus creating more interest in a holiday lights train. A jolly service a community can provide to its children is to run a holiday lights train complete with a decorated train and visits from Santa and other lovable childhood characters. The holiday lights train can take off from the local train depot and run for a short trip returning home. While en route, Santa and other characters can visit with riders in each train car sharing the Christmas spirit with all. A holiday lights train can spread cheer and joy to children of all ages.